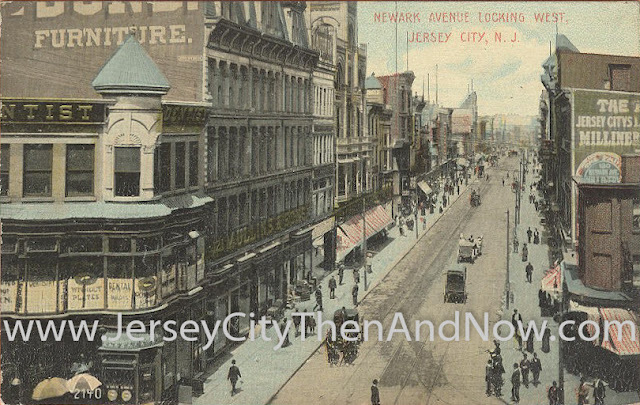 This is a different post compared to the 'normal' then-and-now posts, but someone noticed that the vinyl siding is was being removed today from the first building on the left in post card - currently housing Grove Corner News. Does anyone know what the plans are for the building? A restoration to it's former glory with those amazingly curved windows on the second floor would be a real lift for the Grove Street plaza. And what a place for a bar or cafe. But that might be too good to be true? 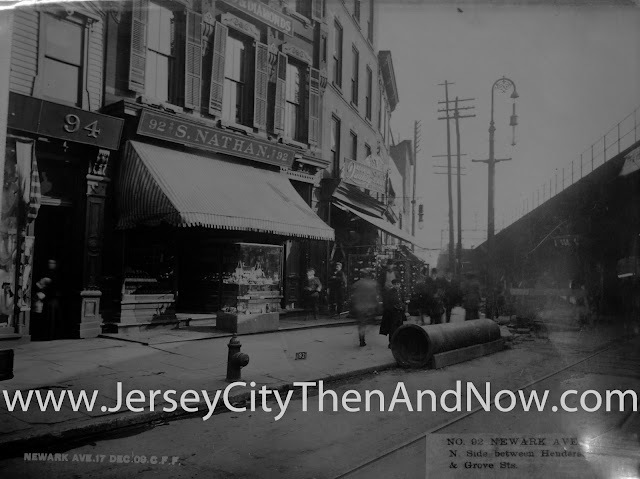 The photos are taken standing on Newark Avenue, at the intersection with Railroad Ave (now called Columbus Ave), looking towards the Hudson River along Railroad / Columbus Ave.
As mentioned in another post, Railroad Avenue got its name from the railroad that ran along it and can be seen to the right in the old photo. When first built, the railroad ran at street level, but later it was elevated as seen in this photo. Based on the caption in the old photo, it was probably taken Dec 17th, 1909. 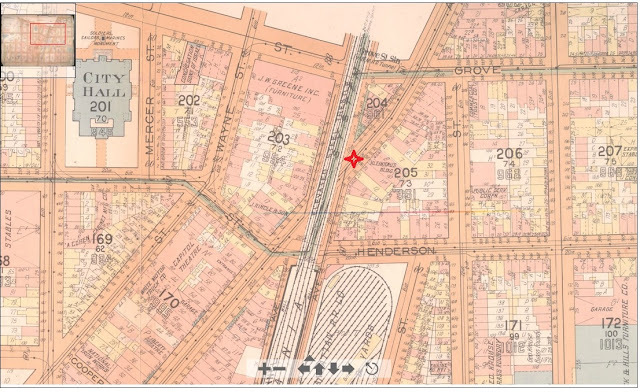 Also take note of the tracks in the lower right corner of the picture that run on Newark Ave - there used to be a trolley running to the Pennsylvania Railroad Terminal at what is now Exchange Place. While Newark currently ends at Columbus Avenue, it used to continue a few more blocks, through what is now the site for Metropolis Towers, all the way to Montgomery St.
As also mentioned in a previous post, all seven (7) city blocks between Columbus Ave to the north, Montgomery St to the south, Marin Blvd (formerly Henderson St) to the west and Warren St to the east were demolished in the 1950s, to give way to empty lots and what eventually became Metropolis Towers. 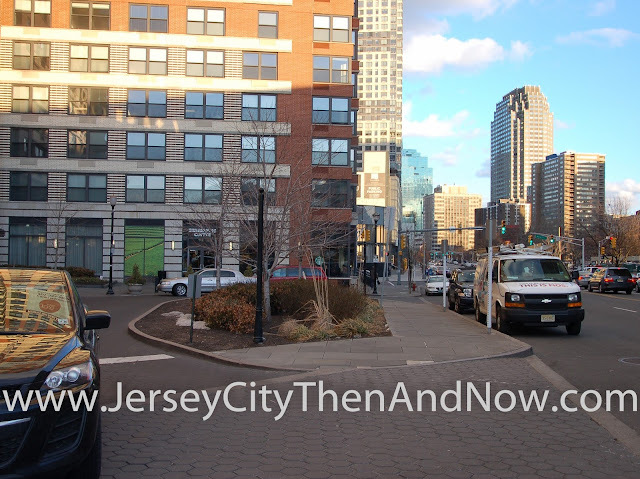 I think that one or two of the buildings in the old photo (probably 90 and 92 Newark Ave) were standing until they were demolished in the mid 2000s to clear the site for Grove Pointe. At that point they had lost their architectural details though, and were hardly recognizable. There has been a debate in various forums of whether the Grove Pointe building has had a positive impact on the development of downtown Jersey City, or whether it just rode a wave of development that had already started. I don't claim to know, but while it's unfortunate that some historic buildings were demolished, one could at least hope that a significant influx of residents (there are 525 units in Grove Pointe) would mean more people would frequent local restaurants and shops. What do you think? Do you have information or anecdotes? Please use the comments functionality below. The old picture is from Jersey City Free Public Library's great collection of historic pictures in the New Jersey Room at the main branch. The map is from Rutger's online collections. 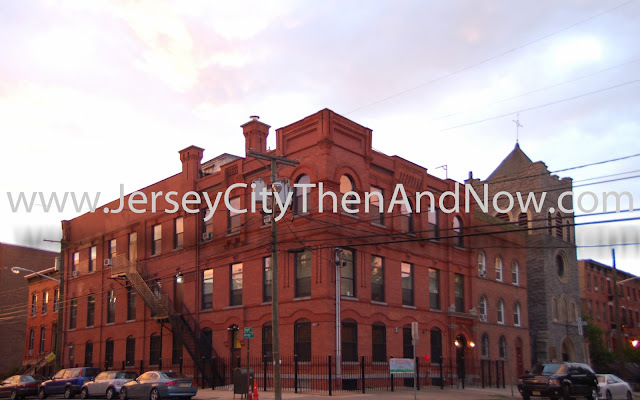 [The Palma Athletic Club has ] a splendid club house at the corner of Jersey Avenue and Bright street. As you enter the building you go directly into a splendid bowling alley which with a rifle range, entirely occupies the ground floor. Directly over the bowling alley and rifle range are the parlors and reception rooms. Rising to the full height of the building in the rear and occupying a space 40 by 48 feet is the gymnasium. The club is social as well as muscular, ladies who are friends of the members being given the privileges of the bowling alleys and rifle range five afternoons each week. Again - it would be fun to hear from you and if you have information or anecdotes, please use the comments functionality below.